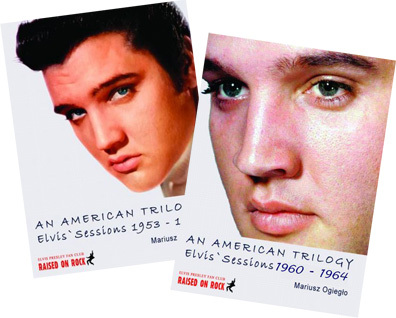 The Polish "Raised On Rock" fan club started a four magazines series entitled "An American Trilogy" on Elvis Presley's recording sessions. The first issue, "Elvis' Sessions 1953-1959" was released March 18, 2008, volume two will be published this May. Each issue contains over 80 black and white pages with detailed descriptions of the sessions, songs, recollections of the musicians and a lot of interesting photos. The series is limited and each magazine has its own individually written number. I think maybe it's because it's 3 decades - 50's, 60's 70's but I may be wrong :-) Anyway it's pretty cool stuff for Polish fan, as we don't get any Elvis related books at all.